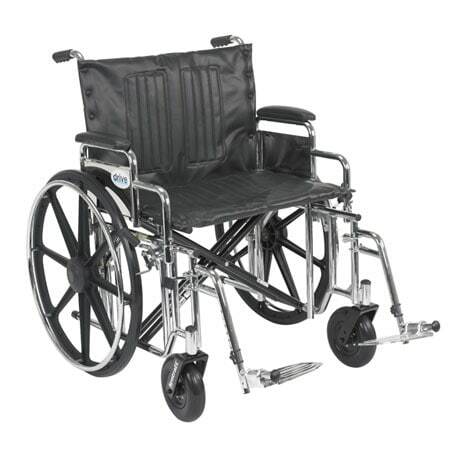 This wheelchair has features that will make it last for a long time such as a carbon steel frame that's made to withstand years of use. It has reinforced steel gussets at critical points to make the frame sturdier. The composite wheels are super tough while being light, making this chair roll smoothly and easily. Easy-to-use wheel locks keep this chair anchored when you need it to stay in one place. It has a weight capacity of 500 lbs thanks to dual cross-bracing on its frame. Unlike cheaper nylon upholstery found on less expensive, less durable chairs, this chair has heavy-gauge, reinforced naugahyde upholstery that's as comfortable as it is tough. You'll enjoy the comfort of its spacious 24" wide seat, plated chrome handrails, and the padded armrests that make this chair a pleasure to use. The frame is triple coated for an attractive, yet durable finish that'll last for years to come. Ships directly to you from the manufacturer. Item can only be shipped within the Continental US.